As the weather changes so does the maintenance needs of your pond. As true as this statement is what does it mean?? Here is a check list to determine what your pond needs. Why do I have more algae this time of year? This will determine how many aquatic plants your need. Or how big a pond pump and filter your need. 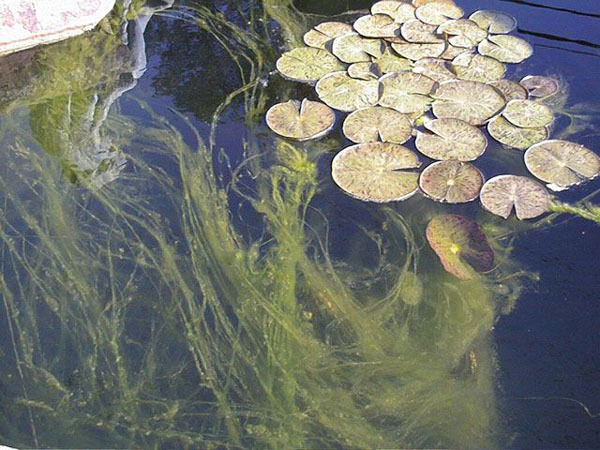 Adding pond plants to your pond is the best way to balance it so you will not have algae. If you do not have a filter then to achieve an ecologically balanced pond you will have to shoot for 60%-75% of water plant coverage. 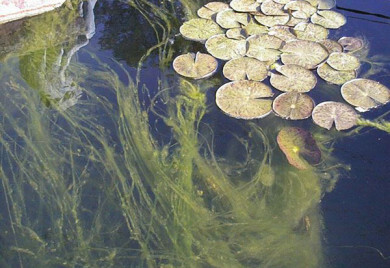 Aquatic plant work well to use up excess nutrients from the pond so nothing is left for the algae to grow. So pond plants starve out the algae. Lot of pond plants equals less algae! What pond plant should I choose? This can be water hyacinth or water lettuce which grow very fast, are very inexpensive but are annuals, so will die each winter. This can be water lilies, which are one of the best choices because they use the most nutrients to grow and will shade your pond. But honestly any pond plant will to the trick. If you want to up-grade to a filter little easier to maintain and more effective you can choose a LAGUNA Pressure-Flo Pressurized Filters. It comes in four sizes with or without a Uv sterilizer. A U.V. sterilizer or clarifiers is a great way to get rid of green water. It is designed to eliminate algae spores as the water passes by the bulb. They work exceptionally well. and comes in many sizes so you can get just the right fit. The next jump up in filtration is the ultimate. You can abuse your pond a bit with full sun, no plants, too many fish and it will still get the job done. This option is the rapid sand filter. We recommend a few changes to the media choices, but it fitted with the appropriate pump will be the easiest most effective equipment you can get. All pond filters, pond pumps, aquatic plants will help to keep you pond healthy and clean but they MUST be maintained properly to work at their best. When was the last time your pond was cleaned? We do not recommend draining your pond unless it is indeed dirty. Dirty happens in the winter months from the rain and wind. Debris washes into or blows into your pond. This debris will contribute to creating algae. If there is more than an inch on the bottom of your pond it may be time to do a drain and clean. If it is not too much you can also try a sludge remover like Bio Sludge Control from Laguna. It will break down and process debris from the bottom of your pond. Remember if you do drain your pond it will need to go through the balancing process again. This process can take anywhere between a week and two months depending on what equipment you have, how many fish you have and how much sun you have. Hope this helps you with your springtime algae questions! Happy Water Gardening!! Article: Green time of year! Time to Add New Pond Supplies And Pond Plants. Time to Add New Pond Supplies And Pond Plants.